When the word about Andrew Keen's "The Cult of the Amateur" first got out last winter, I was hopeful. Finally, I thought, we'd have an informed and comprehensive antidote to the poisonous hype around all things two point oh: all those conversationalist wise crowds of long-tailed lonelygirls-15 blogging their ride on the participatory cluetrain. This book was supposed to be a cold but refreshing shower on the parade of the new irrational exuberance. I picked it up in an airport bookstore last week hoping for a pleasant flight across the Atlantic. Mr. Keen has built the book on the premise that the newly gained easy access to content production and distribution technology has enabled the unwashed masses of amateurs to populate the web with worthless drivel that is drowning out the professional culture makers -- the artists, the music labels, the publishers, the newspapers, the retail stores. This sentiment, of course, is not uncommon, is not without its merit, and definitely deserves attention. It would even make a good book, as perhaps it one day will. But that good book isn't Mr. Keen's. Instead, Mr. Keen's book is one of bizarre inconsistencies, of self-righteous cliches, of stretched or omitted facts, and of shrill Ann Coulteresque diatribes that are entertaining in their boldness but quickly become boring in their monotony. It must be unnerving for the author who rails against amateur critics to have his book trashed on a blog without any lit-crit credentials, but it is equally puzzling to hear about "blogging monkeys" from someone who promotes the same book on a dedicated blog of his own. Mr. Keen has a lot to say against the culture that encourages mash-ups of others' content, taken for free, at the expense of original production. Yet The Cult of the Amateur is just that -- a mash-up of assorted articles and freely available research peppered with opinionated prose that is very blog-like in the very sense that Mr. Keen is criticizing. Then there are facts and their conspicuous absence. Mr. Keen's multi-page rant against Wikipedia fails to mention Nature's study that showed Wikipedia and Britannica being roughly of the same accuracy, or that that the number of Wikipedia's entries was 8.5 times greater than Britannica's in 2005. Mr. Keen observes that on the day of Anna Nicole's Smith's death, "her Wikipedia page was flooded with conflicting, speculative versions of the cause of death" and cites this example to argue that Wikipedia is inherently untrustworthy. He doesn't mention, however, that that particular article, just as all others on developing events, featured a big disclaimer on the top of the page warning the readers of potential inaccuracies. Mr. Keen also doesn't mention that those very changes in the Wikipedia article were based on the media reports that had been supposedly done by professional journalists who, in Mr. Keen's words, "acquire their craft through education, through experience of reporting and editing the news under the careful eye of other professionals" and are thus superior to citizen journalists. The whole argument about professional journalists and content makers, and the vetting process, and established gatekeepers very quickly deteriorates into a traffic jam of a guilt trip. The reader is supposed to feel bad about the "painful layoffs" at Britannica, about how when a free Craigslist ad is posted, a dollar is taken away from some poor newspaper's budget, how the movie industry is struggling (domestic box-office in 2006 was up 5.5% from the previous year), how the music industry is dying (judging by the RIAA's numbers). And blogging? Blogging is for losers, Mr. Keen argues. Bloggers are ego-driven maniacs (a statement not entirely inaccurate) who don't create any value, spread rumors, and are one-sided in their commentary. And no, the old media are not like that at all. Oh, and bloggers don't make any money. Mr. Keen cites Guy Kawasaki who apparently had made a measly $3550 of ad revenue in 2006 off his otherwise very popular blog. Guy, if you would like to double your ad revenue in a month, ask me how. 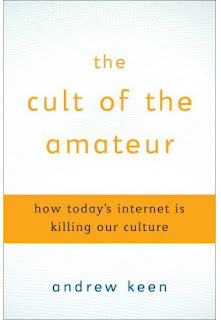 "The Cult of the Amateur" is on Amazon for around $16. The NY Times' review is here.